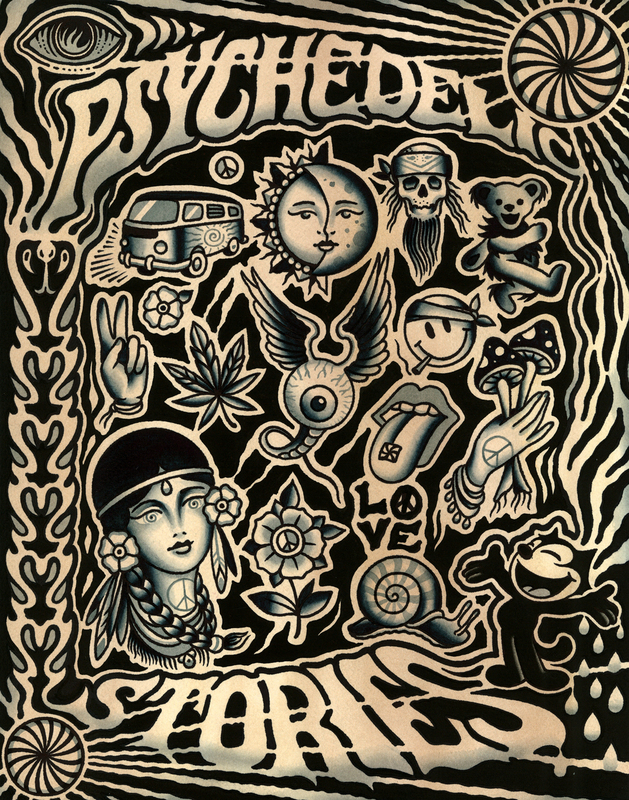 Paul Dobleman: Psychedelic Stories February's WINNER! Amnesia! I liked drugs in the late '80s/early '90s. I liked acid, mushrooms, pot, ecstasy and alcohol best – sometimes in combination of two or more. Although I was mainly into punk rock music, I would go to Grateful Dead shows just for the fun drug-filled adventures in the parking lots with my hippie pals. When I was 19 or 20 I went to camp out at a Dead show in the DC area with a couple of my best childhood friends, Martin and Sheila. We bought some ecstasy from a space cowboy and had a cheap jug of gin. I definitely over-imbibed – drinking the gin like it was water. I was basically flying around the parking lot, meeting people and singing Janis Joplin songs. I found a girl crying because she had lost her boyfriend and told her, "Come with me, we'll find him." Somehow or other I led her straight to where he was and everyone was happy and hugged me. I thought I was magic. I suddenly decided a shower would feel amazing so I went down to take a shower where they had a hose thing rigged up. That is where I was witnessed having some type of scary seizure. (I don't remember that part.) I fell backwards and my head hit a rock. It was bleeding. An ambulance came. My friends heard the siren and thought it might be for me and came running down. I remember a police officer screaming in my face "HOW MUCH ACID ARE YOU ON?!" I smiled, thinking it was funny because I wasn't on acid, I was on X, silly cop. My ecstasy-addled brain felt compassion for the poor guy having to deal with me at that moment. They took me to the nearest hospital. At one point I swear I saw a chain gang going down the hallway, but I could have hallucinated the whole thing. The next morning after I got part of my head shaved and 6-10 stitches, my friends visited me in my hospital room. I had amnesia. I remembered my friends but my mind had gone back in time a couple of years. I thought I was still 17 years old and living at home. I asked, "Does my mom know where I am?" They didn't know. They had to fill me in that I no longer lived at home, that I was in college and living with my boyfriend, Rob. It was like hearing my future. I had no recollection of Rob but was very intrigued. I looked down at a crystal pendant on a pale blue beaded necklace I had bought for $15 dollars in the parking lot the day before and said at least my future self had good taste. When I saw myself in a mirror, there was blood crusted on my messy black dyed hair. It looked so cool I decided I'd have to dye my hair red next. Apparently I was in very good humor, although my friends were a little freaked out. Sometime that evening my memory came flooding back and I called Rob right away. Thinking of things like this, I feel lucky to be alive. I am a mom, wife, and kindergarten teacher now. I no longer use drugs or drink. 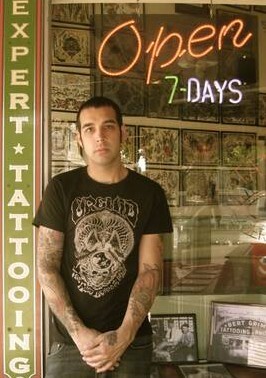 Tattoos are my only vice. 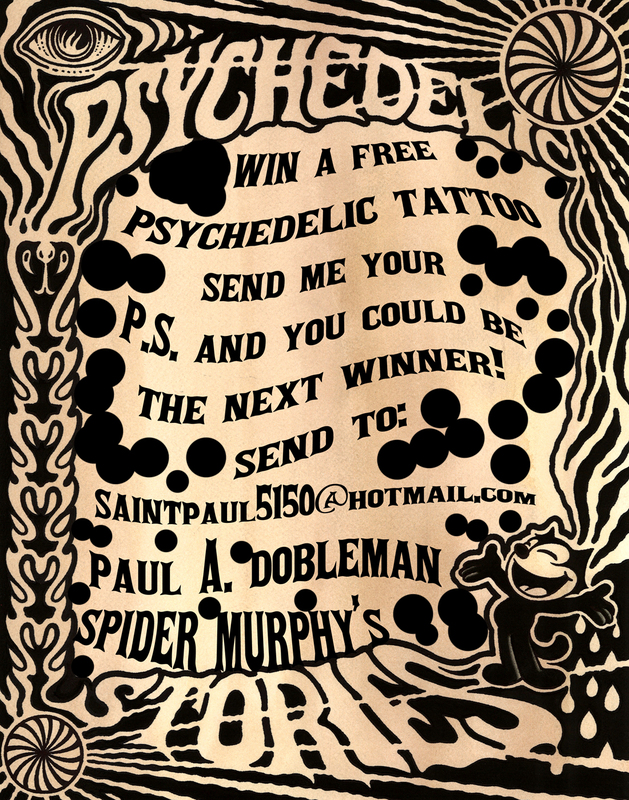 I love your art and wouldn't mind getting a little memento of my crazy psychedelic past.